A group of eight Lehman College students participating in the Lehman L.I.F.E. program traveled this summer to Malawi, a country in southeastern Africa, and during their 10-day stay helped build a primary school. Working as volunteers for the renowned non-profit organization buildOn, Inc., the Lehman students spent several hours each morning alongside members of the Mapango community in the Kasungu district constructing the foundation for a new school. They transported sand for the project, carried water from a nearby well to mix cement, laid bricks and dug pit latrines. After lunch, the students spent the afternoons participating in cultural workshops and sharing reflections on their various efforts and interactions. The students returned "home" in the evenings to their respective host families, where they learned how to make nsima, the staple food of Malawi, and fresh peanut butter. Some of the most meaningful conversations occurred in the evenings with families over dinner, the students reported. Often, they engaged in conversations about gender roles in both Malawi and the U. S., which provided insights for all. One evening was spent storytelling under the stars by a campfire, as the students and the community members shared different folk tales passed down from generation to generation. On their last day in Malawi, the Lehman students and buildOn staff played a friendly game of soccer against a community team. 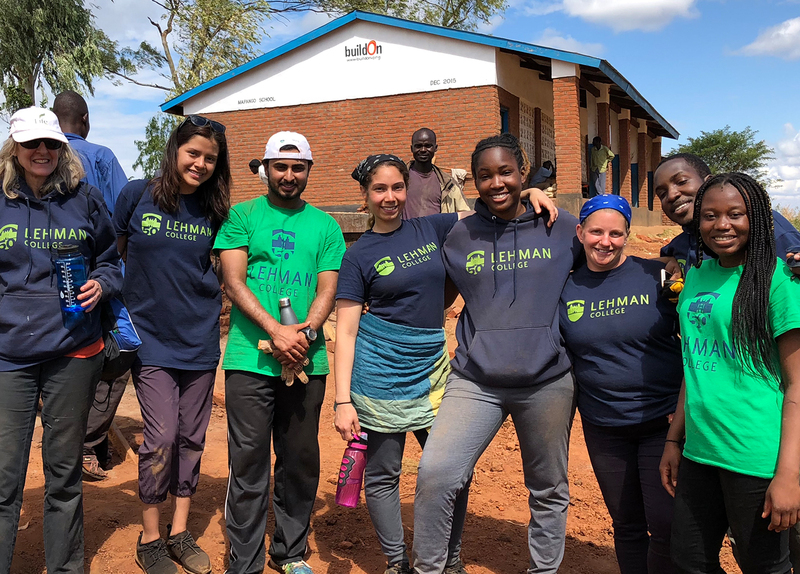 "For our students, this was an extraordinary experience, something they will always remember," said Amanda J. Dubois-Mwake, director of Lehman’s Office of Community Engagement and New Student Programs, who traveled to Malawi as well. "They had an once-in-a-lifetime opportunity to become immersed in an entirely different culture on the other side of the world and be part of a transformative, community-wide effort. Everything was new to the students—language, food, songs, dances—and the joy in their learning was easy to see. Bonds were created with the community that were quite meaningful and incredible to witness." Lehman L.I.F.E. is an organization that supports service opportunities for students around the world and fosters action through volunteer work. The main goal of the program is to increase awareness of the many issues and challenges that affect our humanity, whether here on campus or in communities thousands of miles away. As a precursor to volunteering abroad, the Lehman students participated in the first ever credit-bearing course for Lehman L.I.F.E. and were asked to volunteer in their own communities for 25 hours. The idea was for the students to understand the significance of their contributions with the belief that you cannot volunteer somewhere else if you are not aware of what is happening in your own community. Last winter, a group of Lehman L.I.F.E. students traveled to Apopka, Florida to volunteer with migrant farmworkers and advocate for undocumented youth. Another group of students traveled to Nicaragua during spring break to assist with global health projects and volunteer at a medical clinic. Each Lehman L.I.F.E. experience is completely different, with a variety of new cultural encounters and adventures. "Many of our L.I.F.E. students return to campus after an international service-learning immersion trip with a determination to participate more in their own communities and make a difference, which is exactly why this program exists," said Dubois-Mwake. For more information about Lehman L.I.F.E, please visit the Office of Community Engagement located in the Old Gym Building, Room 302 or visit www.lehman.edu/communityengagement. On October 25th, the Office of Community Engagement will host the 5th Annual Global Citizenship Gala to support scholarships for students participating in this year’s Lehman L.I.F.E. service-learning immersion trips to Puerto Rico and Peru. Information can be found at www.lehman.edu/globalgala.